As I mentioned a few weeks ago, we’ve had some of Paul’s illustrations printed as postcards. The first of these, Hide, arrived at the weekend so I thought I’d share with you the picture, which Paul coloured specially for the promo. On the back of each of the postcards I’ve had a bit of text printed too, giving you an overview of the (fake) movie and some advice on turning it into a scenario. This text actually comes from the Genre chapter of the book, which dissects about a dozen different horror genres, giving you advice for using Dead of Night to emulate them. Each genre also comes packaged with a sample movie, describing the plot of the movie and an overview of how you’d run it as a scenario. 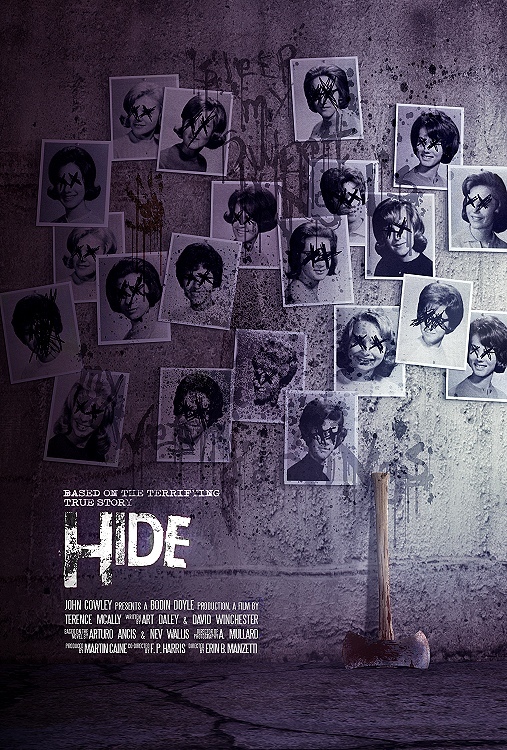 Hide is the sample movie for the Slasher genre, so should give you a glimpse at how the chapter is shaping up. Riding the new wave of slasher movies, Terrance McAnn’s 2005 slasher movie, Hide, purports to be based on a true story. Centred around a hiking expedition in rural America during the 1960s, the story is unusual amongst slasher movies in that it features an all-female cast, the serial killer, Alice, included. The movie is fairly standard slasher movie fare, save for the grim realism it imposes on the whole affair, in stark contrast to the often implausible nature of other movies in the genre, including a killer who succumbs relatively easily to the heroine, once she is finally brought to bear. To run Hide as a Dead of Night scenario, have the players each generate one or two of the hiking party. The monster is Alice, the axe-wielding serial killer who spends the movie hunting them down, one by one; Alice can be effectively represented by either the Hunter or Unstoppable Killer monstrous archetype. The scenario starts when the party realise that they are lost, and the surroundings take on a sinister and slightly surreal turn as darkness falls. Much of the scenario should be spent fleeing from the serial killer and trying to escape her elaborate traps and snares. Escape checks should dominate, as should Assault checks for when Alice catches up with the girls. Survival Point loss can represent the hikers losing ground to Alice, getting further lost in the woods or getting caught in her traps, as well as physical injury. That’s just amazing, and genuinely creepy.